"Shaken, not stirred." It’s how James Bond orders a martini, and it would undoubtedly be how he would order an iced coffee if he was stuck in a café in Italy with time to spare before jetting to some exotic locale. Can you imagine 007 slurping a huge frappucino out of a plastic cup with a straw? 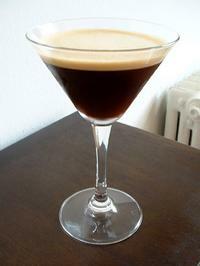 Sipping a caffe shakerato from a martini glass is more like it. Simply made and minimally presented, the caffe shakerato is Italy’s iced espresso answer to the various frozen ‘cinos that dot the landscape. Where these whipped and frapped drinks taste more of cream and chocolate than coffee, the shakerato proudly puts the bold flavor of the bean first. Agitation is the essence of the shakerato (literally, "shaker"-ato), as demonstrated above in the tiny walled city of Monteriggioni, in Tuscany. 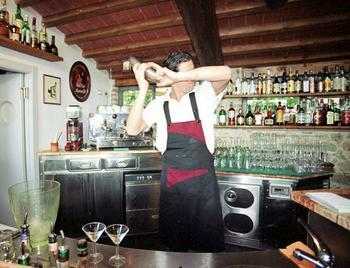 The drink begins to take shape when one freshly-made shot of espresso is combined with crushed ice and a tablespoon (to taste) of simple syrup (equal parts sugar and water, boiled and cooled) in a cocktail shaker. After a good 30 seconds or so of shaking, the icy solution is strained into an elegant martini glass. The result is a deep, dark, concentrated, and extraordinarily refreshing drink topped with a delicious layer of light brown foam, the reconstituted crema that skimmed the surface of the shot before it was plunged into ice. That’s all it takes to make a classic shakerato, though it may also be embellished with a drop of liqueur. At the museum café at the Triennale di Milano, where I had my first shakerato, Bailey’s Irish Cream was a surprise addition that I haven't had elsewhere. If you don’t have an espresso machine, $2.50 will buy you a caffe shakerato made to order at the Crestanello Gran Caffe Italiano, located at 475 Fifth Avenue, across the street from the New York Public Library. 3. Prix-fixe TV Dinners at Le Zinc, 139 Duane Street (between West Broadway and Church), July 30. There was a time when message boards on sites like chowhound were peppered with "burrata sightings" and queries about where to find burrata in the United States, but the mother of all mozzarella cheeses has now become much more widely available here. 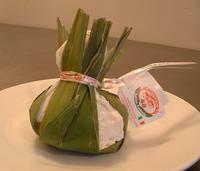 Wrapped in cane leaves, burrata is a beggar’s purse comprised of a thin layer of fresh cow’s milk mozzarella cheese stuffed with a mixture of heavy cream and stracciatella, “little rags” of mozzarella curds. When it is cut open, the contents ooze out slowly . . . until they are swept up with a piece of crusty bread. For a very rich caprese salad, surround a fresh burrata with slices of the ripest, freshest tomatoes, torn basil, and olive oil. Imported from Puglia, a pound-size serving is available at Agata & Valentina on New York’s Upper East Side and the Bedford Cheese Shop in Williamsburg, Brooklyn. Variations are also sold with porcini mushrooms or black truffles incorporated into the filling. Gioia Cheese Co., an Italian cheese producer in southern California, produces a domestic version. 1. Pansotti with walnut sauce at Bread Tribeca, 301 Church Street. 2. Tacos at one of New York's grocery-taquerias. 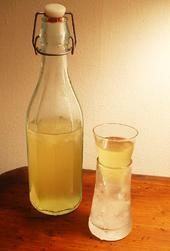 The limoncello has been bottled and sitting in the freezer for over a week. In the process, it became partially frozen solid, which may be due in part to the fact that the vodka was only 80 proof (several other recipes called for vodka that is a minimum of 100 proof). This may also be due to the amount of simple syrup that was originally added to the lemon zest/vodka mixture. Though the recipe was followed verbatim, the final product may not have frozen if there was a higher proportion of alcohol. How does it taste? Definitely better than the store-bought version. 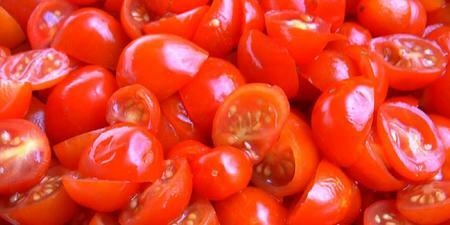 It has a freshness that hits your sense of smell immediately when you take your first gulp. But, if I was to attempt to make this again, I would modify the recipe to include a smaller amount of simple syrup. The Culinary Archives & Museum at Johnson & Wales University in Providence, Rhode Island, is featuring an exhibition entitled, Diners: Still Cookin' In the 21st Century. The interactive exhibition traces the history of diners from their origins in the 19th century as horse-drawn wagons to the modern "retro" diners of the 21st century. The exhibit is based on the collection of diner historian Richard J. S. Gutman, the author of American Diner and American Diner Then and Now. The artifacts on display include a life size replica of a classic lunch counter and the entire 15-stool Ever Ready Diner, a 1926 Worcester Lunch Car which formerly operated in Providence and is now awaiting restoration. The exhibit opened in June and runs through 2008. Photo: www.dinercity.com. 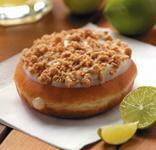 In June, Krispy Kreme introduced a special Key Lime Pie donut, a yeast-raised donut with key-lime flavored cream, cream cheese frosting, and a crumbled graham cracker topping. The fried and filled dessert weighs in at 24 grams of sugar, 40 grams of total carbohydrates, 330 calories, and 18 grams of fat, according to Marilynn Marter of the Philadelphia Inquirer, who gives it a thumbs up: "This confection is as decadent as it is finger-lickin' good." The special donut is available through August. Photo: www.krispykreme.com. 1. Taste both kinds of egg creams (the one with Fox's U Bet Syrup and the one with a syrup of bittersweet Venezuelan or Belgian chocolate) at Bespeckled Trout, 422 Hudson Street (St. Lukes Place). 2. Visit Chocolate: The Exhibition at the American Museum of Natural History. 3. Go to The Lobster Place at the Chelsea Market for their $8.95 lobster roll. The menu for The Chocolate Garden, a dessert parlor that was located in Venice, California, circa 1920s, is one of many historic restaurant menus that can be found at the Menu Collection at the Los Angeles Public Library. The collection is searchable online by keyword, restaurant name, cuisine, and year. Many of the menus contain fascinating cover artwork reflecting the graphic design sensibilities of the periods in which these restaurants once existed. They also offer a unique window on the palates of the past. On the menu at The Chocolate Garden: "Chop Suey Sundae," 20 cents. According to the following recipe from the National Soda Fountain Guide, the concoction included raisins, dates, vanilla ice cream, flaked coconut, and chow mein noodles. More historic soda fountain recipes from the 1920s.